One of the great surprises I’ve encountered in doing genealogy work is that I have many more surnames in my family than I ever knew. I knew about Goldschlager and Brotman, on my mother’s side, and I knew about Cohen, Schoenthal, Seligman and Katzenstein, on my father’s side. But I never knew that I was also a Rosenzweig until I found my great-grandmother Ghitla’s maiden name, and now I know that I am also descended from the Jacobs family on my father’s side. My great-great grandmother was Sarah Jacobs, married to Jacob Cohen. My great-great-great grandmother was Rachel Jacobs, married to Hart Levy Cohen. Although I have not yet found any familial connection between Rachel and her mother-in-law Sarah, I have found some evidence of Rachel’s parents and siblings. First, I noticed that a man named Lazarus Jacobs was living with Rachel and Jacob Cohen in Philadelphia in 1860. Then yesterday while researching the Cohens in the 1860s, I found a Philadelphia directory that listed Jacob’s business partner as Joseph Jacobs. I assumed this was another of Rachel’s relatives, but was not sure how they might be related. After some further searching, I found Joseph Jacobs on the 1841 England census, living with his parents Reuben and Frances and his siblings Rachel, my great-great-grandmother, and Lazarus, the younger brother who was living with Jacob and Rachel in 1860. 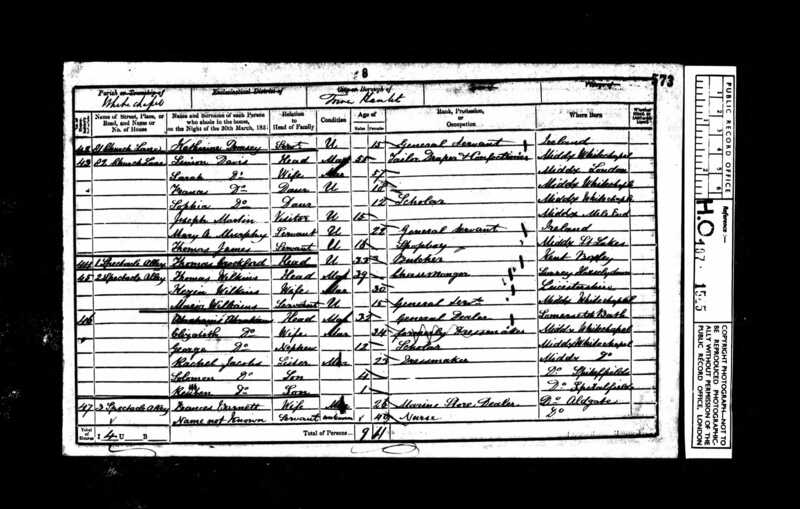 Joseph and Rachel had a son, Solomon, born in 1848, and a son Reuben, born in 1850. Both were living with Rachel on the 1851 England census. Rachel was listed as the sister of the head of household, whose name was Abraham Abrahams; his wife’s name was Elizabeth. I cannot find a Rachel Abrahams on the marriage registry on the BMDIndex, and although I did find an Abraham Abrahams married to an Elizabeth Levy, I also wonder whether the census taker took down Abraham’s name incorrectly since there is also an Abraham Jacobs married to an Elizabeth. At any rate, the bigger question is— where was Joseph? My guess was that he was in the US, preparing to move the family to Philadelphia. 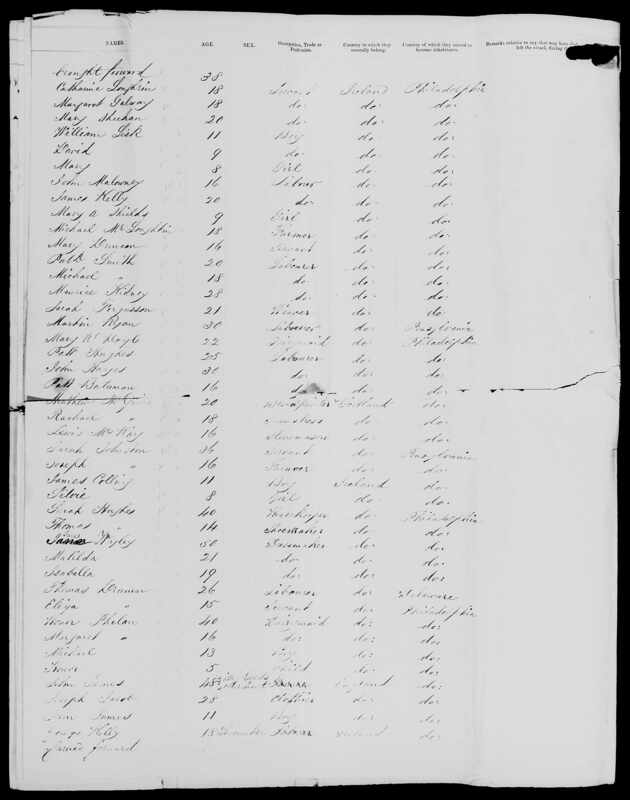 I could not find him, however, on the 1850 US census nor could I find him on a ship manifest for that time period. I did, however, find a Joseph Jacobs on the 1851 England census as a visitor in Birmingham, England; he was listed as born in Middlesex, London, and his occupation was as a general dealer, so my guess is that Joseph was simply away on business the day the census was taken. Joseph and his family left England and, like Joseph’s sister Rachel, settled in Philadelphia. It appears that Rachel Jacobs and her three children, Solomon (4), Reuben (2) and Emanuel, who was described as an infant, left in 1853 along with her brother-in-law, fourteen year old Lazarus (L. Jacobs on the manifest). 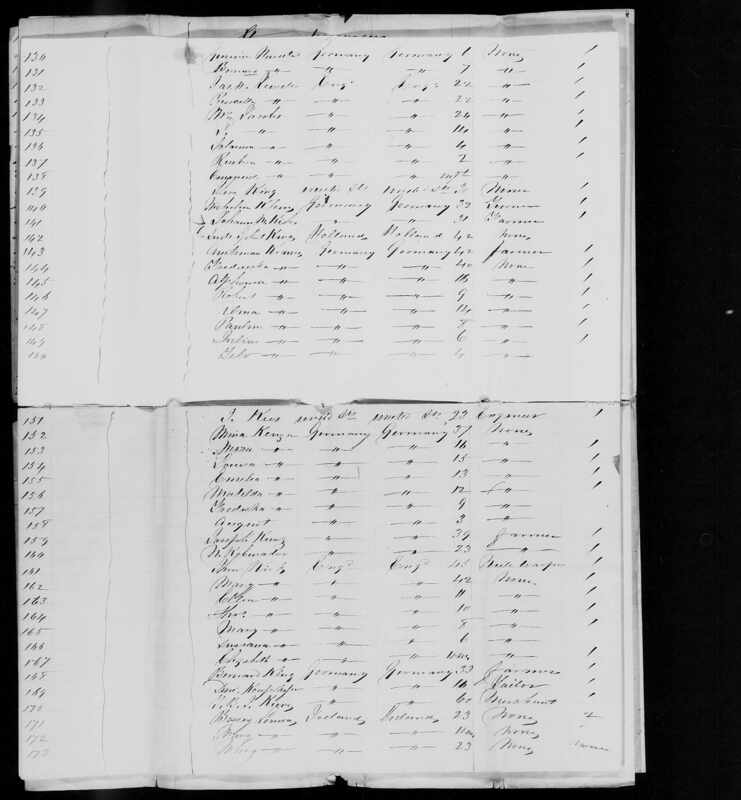 Rachel Jacobs and children 1853 ship manifest “Pennsylvania, Philadelphia Passenger Lists, 1800-1882”, index and images, FamilySearch (https://familysearch.org/pal:/MM9.1.1/K8CH-1V8 : accessed 20 May 2014), Jacobs, 1853. Her husband Joseph may not have left until 1854. 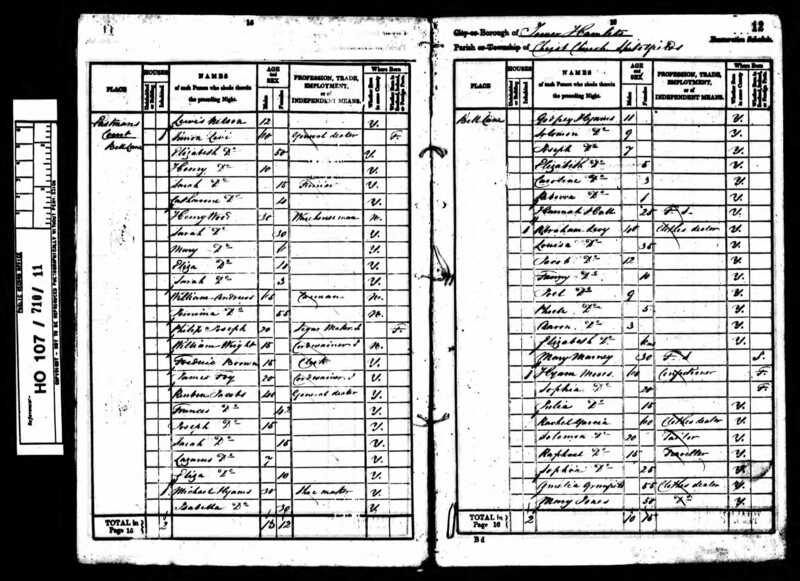 These dates make sense because according to the 1860 US census, their daughter Frances or Fanny was born in England and was six at the time of the census in 1860, but their daughter Esther was born in Pennsylvania and was already two years old in 1860. What seems inconsistent, however, is that Frances/Fanny is not on the ship manifest with either her mother Rachel or her father Joseph. Perhaps the 1860 census was incorrect, and Frances was born shortly after arriving in the US, but the 1870 census also has her listed as born in England, so more likely she just wasn’t included on the ship manifest. 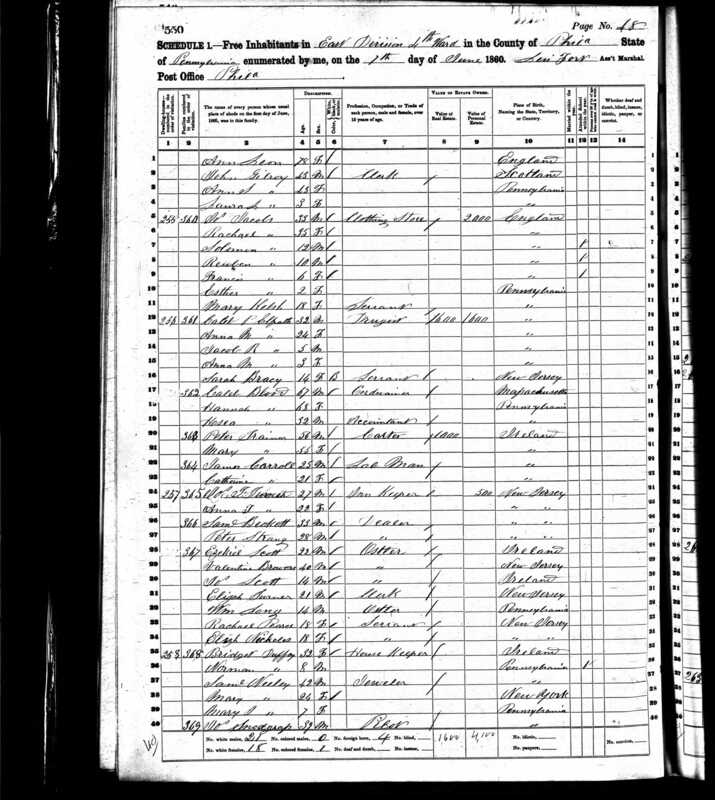 Emanuel Jacobs, however, although listed on the ship manifest, is not included in the 1860 census. In fact, a later born child was named Emanuel, born in 1866. So was “Emanuel” on the manifest really Frances? Or did the first Emanuel die? Sadly, it was the latter. Emanuel died on May 3, 1860, of heart disease, according to the US Federal Census Mortality Schedule. 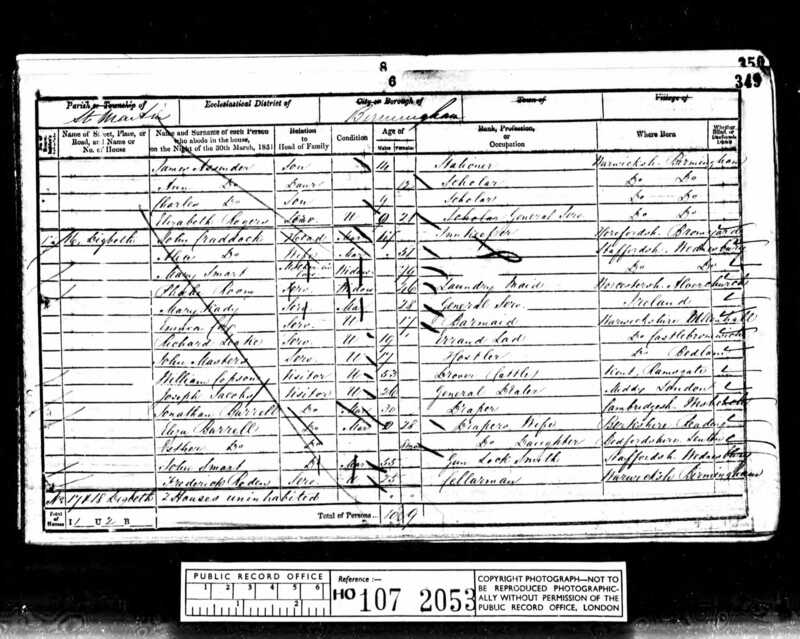 The Philadelphia death certificate identifies his father as Joseph Jacobs residing at 150 South Street, so this is definitely the right child since that is where the Jacobs family was living in 1860. The certificate also says that Emanuel had been in Philadelphia for 2 and 2/3 years, meaning since sometime in 1857 (which seems incorrect unless they lived elsewhere between 1853 and 1857), and although I cannot decipher the age very well, I think it says he was 8+ years, meaning he was born sometime either in 1851 or 1852, which would explain why he was not on the 1851 census, but was on the 1853 manifest. Apparently, the second Emanuel, born in 1866, was named for the deceased older brother. That does not explain where Frances was, however, when the rest of the family was sailing to Philadelphia. In 1860 Joseph Jacobs and his family lived at 150 South Street in Philadelphia, not more than a few houses from my great-grandparents who lived at 136 South Street. He was in business with his brother-in-law, Jacob Cohen, my great-great-grandfather. 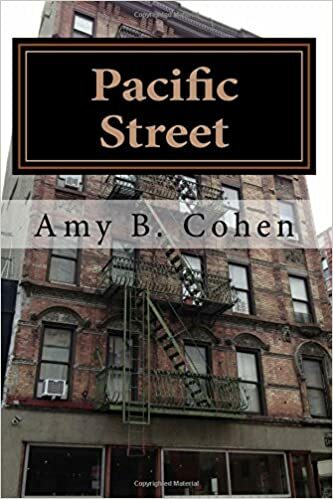 Although I will track what happened to Joseph and to Lazarus after 1860 as well as research Joseph, Sarah, and Lazarus’ parents in England, for now I will return to the Cohen family and finish their story before returning to my newly discovered family line, the Jacobs. The tree just keeps on growing. This entry was posted in England, Jacobs, Miscellaneous information and updates, Philadelphia and tagged Cohen, England, genealogy, Jacobs, Joseph Jacobs, Philadelphia by Amy. Bookmark the permalink. Thank you, Bruce! It is actually one of my retirement goals–to turn my research into a book. I want to start with the Brotman family and take what I have done and arrange it in some kind of chronological order so that our kids and their kids can read it in someway that makes sense, rather than scattered throughout the blog. Thanks for the encouragement. I hope you are doing well. Hi Amy: My name is Richard Jacobs, and I have read some of your blog, and am very impressed with your research process, it is excellent. Keep up the good work. I am related to Abraham Brotman through his wife Minnie (nee Holander OR Hollander OR Hollender). Her parents are Samuel Shim Shin Holander and Beile Bleiweics. She had a brother Josef, and a sister Sima. I do not know if this is of any value to you or not. I am in the process of researching the family and will share the info with you. My Jacobs line goes back to my great-grandfather Harris Jacobs, and was born about 1835 in what is thought to be Dobrozyn, Poland. But, at the moment I’m not sure which one. In most of the records he claims to have been born in Russia Poland (possibly the Pale). He was married abt 1862 or 1865 to Esther Falereck, they had 8 children, Lena, Cathy, Harris, Anne, Rosey, Charles, Mathew my gf., and Jenjamine. The lived in lower Manhattan, and moved to Chicago, Cook, Illinois before 1900. Harris died in Chicago in 1933. I don’t know if any of this will help or not. Richard, I am delighted to hear from you. I think our Brotman tie is closer than any Jacobs tie. I will email you tomorrow when I am more awake! Thanks for reading and for contacting me.